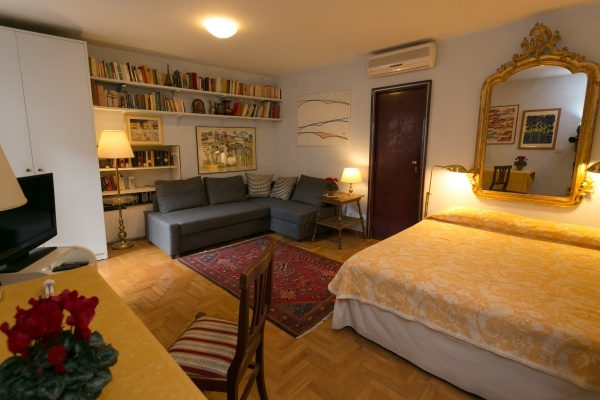 One block away from Piazza Navona, walking distance from all the major attractions in Rome, 3 min. walk from Campo dei Fiori. nice terrace with table and 4 chairs and stunning view on Santa Agnese in Agone’s cupola. Independent heating, a/c, tv, stereo, wi/fi wireless internet connection, no phone, no elevator, terrace.Monthly possible. Es hat alles super geklappt, David hat uns die Wohnung gezeigt und war super nett. Die Wohnung war super gemütlich und die Terrasse mit Blick auf die Kuppel von Piazza Navona war auch super. Zwischendurch war mal das WLAN weg, aber das kann man in Rom durchaus verkraften. Die Lage ist der Wahnsinn, das Viertel eins der Schönsten und es macht Spaß durch die Straßen zu schlendern. Nur zu empfehlen! Grazie mille! Appartement parfaitement situé au centre de Rome au bord de la place Navone. Le quartier est vivant et l'appartement calme. Nous y avons séjourné 3 jours en famille et avons passé un très bon moment. Plusieurs lignes de bus permettent de rayonner vers les différents quartiers de Rome. Et La terrasse permet de prendre des repas au calme, très agréable avant ou apres une bonne journée de visite. Béatrice a été vraiment très attentionnée. Nothing can beat the location of Beatrice's place, right in the heart of old town and in walking distance from all the biggest attractions. Beatrice was a lovely and gracious host, providing us with great restaurant tips and she was always available for any questions we might've had. Final bonuses were the beautiful little terrace on the 4th floor in the heart of Rome and the fact that the place was superbly clean. Thank you for everything Beatrice, we look forward to seeing you again on our next visit to Rome. The locaties is really superb, near Piazza Navona. The appartement is very nice, big enough for 2 people and the service is great. Everything you need is there, in the livingroom, kitchen and bathroom. We can really recommandeer this appartement .